This version is what I had in mind originally for this scene. I wanted to create strong, cool, white highlights from directly overhead, produced by the starry sky. I have seen the effect of moonlight at night on a scene, where the cool light “washes out” most of the colour of objects. I was trying to achieve that effect, whilst still having the contrast of the warm glow of the candle/torch/oil lamp in the stable, to counteract & contrast the cool starry light. I created the initial colouring of this scene, & then added layers to simulate the cool starry light. I realised that this would “rob” the scene of its colour. I wanted to remain true to my initial design, which focussed on the strong tonal contrast of the starry light above & deep shadows below the figures & objects. I normally create side highlights & shadows in my pictures, but this design was a departure from that norm, which was exciting… how would it turn out!? I was in a bit of a quandary though, as I realised that this high contrast, low colour scene would probably not be popular with anyone else! I think most people like my cartoons for their more vivid colours & I imagined that one without much colour in it might not be very well received. Then it hit me: why not provide more than one version of the same scene on the BC website? That way I can remain true to my initial design (the starlight version) AND provide alternative versions, which may be more popular with viewers… & my buying customers! Remaining true to my initial design & inspiration is very important to me, as an artist. Without that I am ‘merely’ providing a commercial product, which can rapidly become a rather soul-less way to operate & live! And I have NEVER wanted to live that kind of life, especially as an artist. Of course this kind of artistic integrity is very important, but I couldn’t ignore the possibility that some/most/all other viewers of the scene might not like my starlight version! And I realised that it is also important to me that people view & buy my work… customers purchasing the work enables me to draw new scenes & keep the BC website “on air”. Without that patronage there would be no cartoons & no BC website at all, so the commercial importance of the scene didn’t escape my notice either! This version concentrates on the colours of the figures, clothing, stable, animals, etc. The depth of the shadows & the high contrast of the highlights produced by the starry sky overhead is more subtle, and less dominant in this version of the scene. The warm glow of the cangle/torch/oil lamp in the stable plays an important role in creating a cozy feeling in the viewer. This is the version that I believe many of my viewers/customers will like. It should “tick the boxes” for many viewers, & hopefully achieve some sales too. This was the third & last variation which I tried of this scene. I wanted to create a rich, turquoise layer which would sit over everything, providing a unifying colour throughout the scene. I like the way this came out, even though it wasn’t my initial design concept for this scene. That’s why I made it available along with the other 2 variations. After noticing the three wise men in the foreground, the warm light from the stable focusses the viewers attention on the Nativity scene itself: the arrival of Jesus in our world. 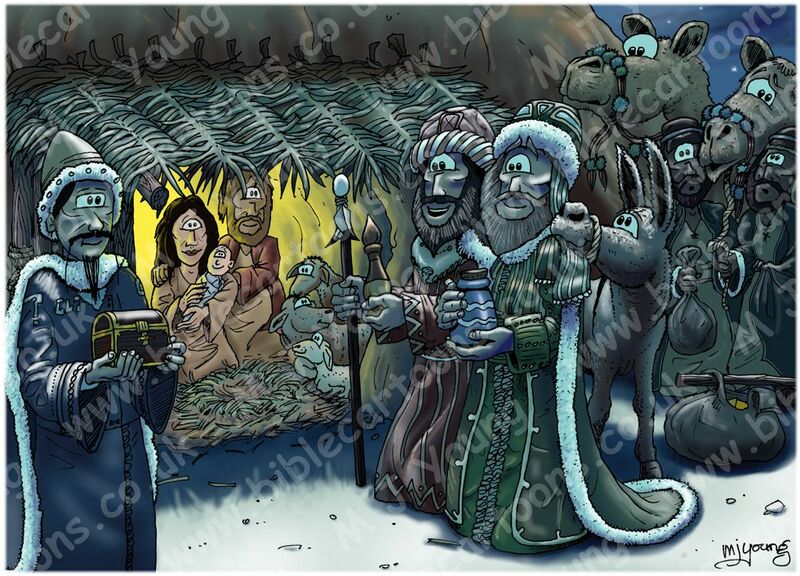 I like the fact that this scenes’ most dominant feature is the birth of Jesus: the saviour & true light of the world.